‘Boy On Motorbike’ 3D Wall Mural At Lebuh Ah Quee by Ernest Zacharevic – The famous painter artist in Penang who did the scary kung fu girl, the 3D bicycle brother and sister and more wall mural has did one latest mural again at Lebuh Ah Quee, just a street next to Armenian Street which features a young boy painted on the wall riding on a real motorcycle mounted to the wooden door. Cool right? I didn’t get a chance to take closer photo of it cause I was just passing by that place. I’ve read that there’s another nice mural at Chew Jetty by Ernest too! Unfortunately, I don’t have much time to explore around as I only back to Penang for a short weekend, moreover it’s more likely a business return-home trip to me. 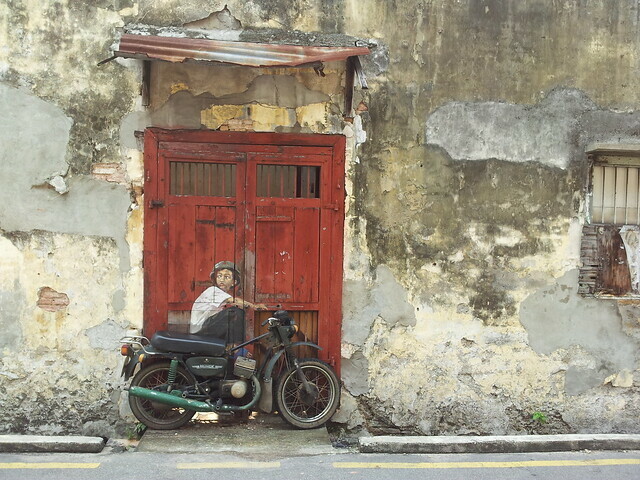 Next holiday, I’m gonna go explore all the cool street wall art of George Town! ONE COOL THING: Experience the Samsung Galaxy S3 With Celcom! Haha! It’s time to share some cool stuff with you guys, have you guys tried out the new Samsung Galaxy S3? It’s very powerful with 8-megapixel camera, super huge and crystal clear 4.8″ HD Super AMOLED display and you can store all your pictures, music and videos with up to 64GB via microSD. Nice right? Now you can experience the Samsung Galaxy S3 from as low as RM1,398 (RRP: RM2,199) with Celcom Exec! Get one for yourself now from Celcom! Celcom has the widest network coverage anywhere in Malaysia, indoors, outdoors and on-the-move. It also has the best network quality too! Sign up at your nearest Celcom Branch or Blue Cube now. Meanwhile, get more information about Celcom packages at www.celcom.com.my/smartphones.